I purchased some fabric not too long ago made by Windham Fabrics called Rescue Me! It is a small collection of fabrics about rescuing and adopting cats and dogs. Very cute line of fabrics! One of the animal rescue groups I support is S.A.F.E. Sanctuary (Save Animals From Euthanasia) in Faribault, Minnesota. 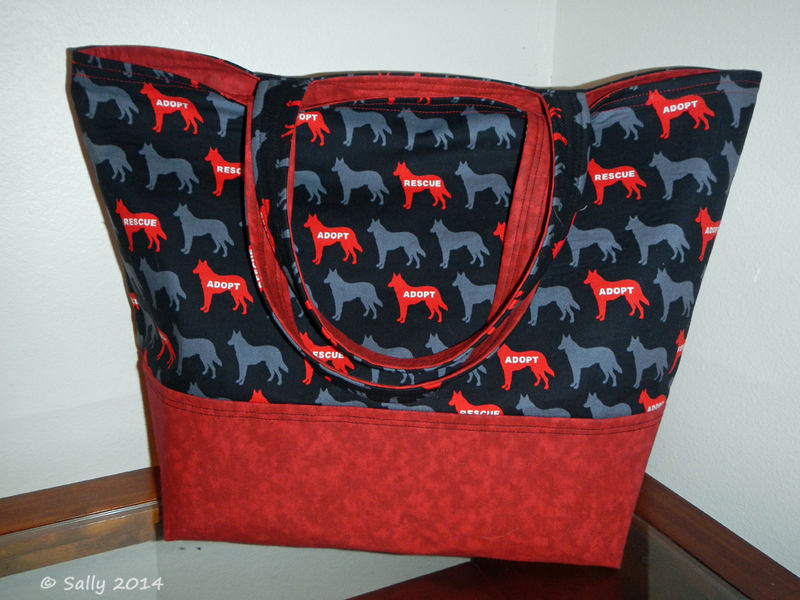 They are having a fundraiser in February so I decided to make a tote bag from the rescue fabric and donate it to them. 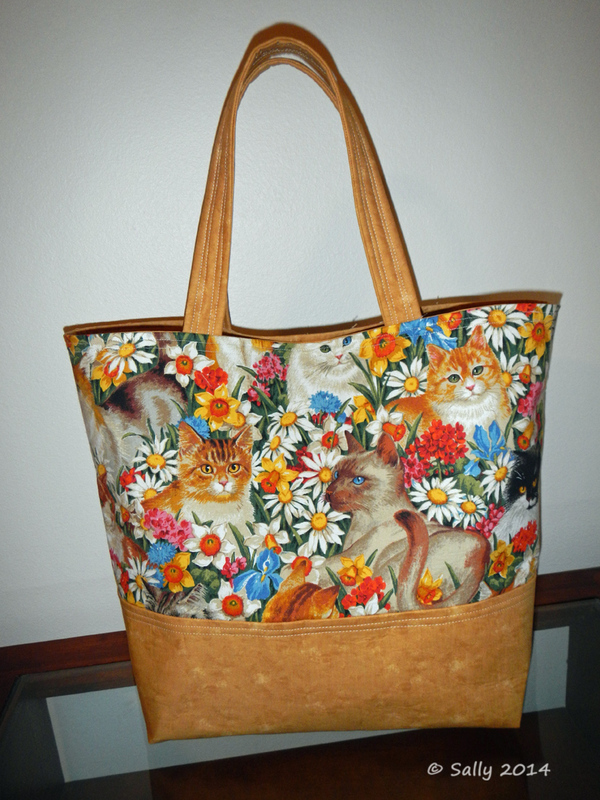 Hopefully someone will bid a lot of money on the tote bag to help support their efforts in animal rescue. 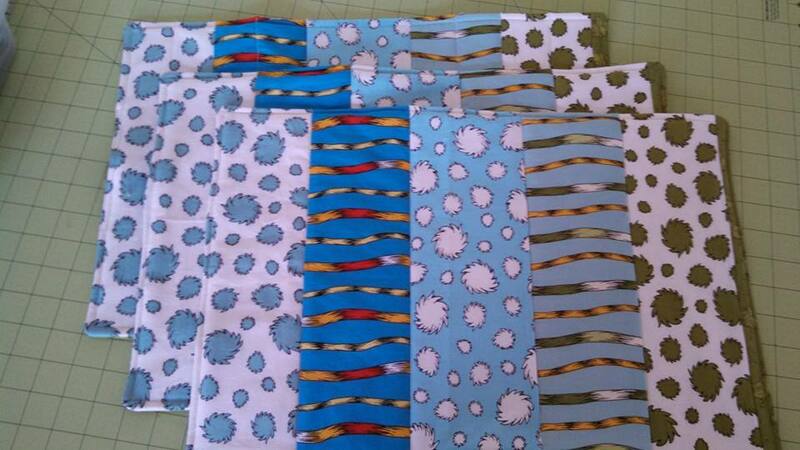 I have another color way of fabric in the dog print and then one in cats. I plan on making more totes and donating them to a couple of other shelters I support. 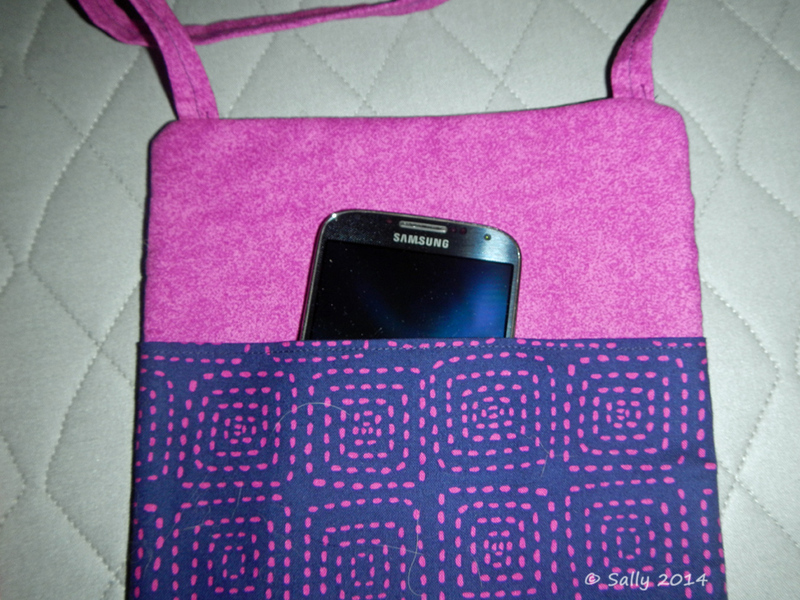 I love this fabric and it is being put to use for good causes! In addition to the bags and wallets I made for Christmas, I also managed to get a few quilts done in the last two months. My mother pieced and did the binding on this quilt for my Aunt Sally. I did the quilting on it for her. It was all free-hand work. 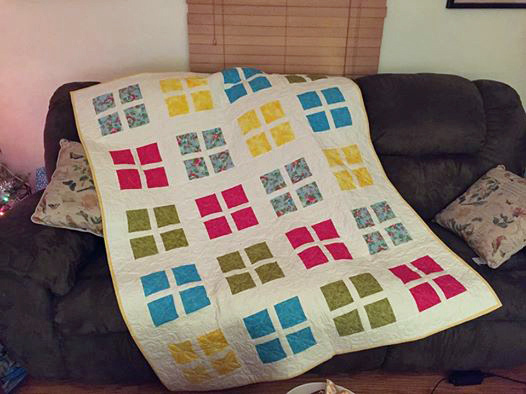 My mother also did the piecing and binding on this quilt for my Aunt Wendy. 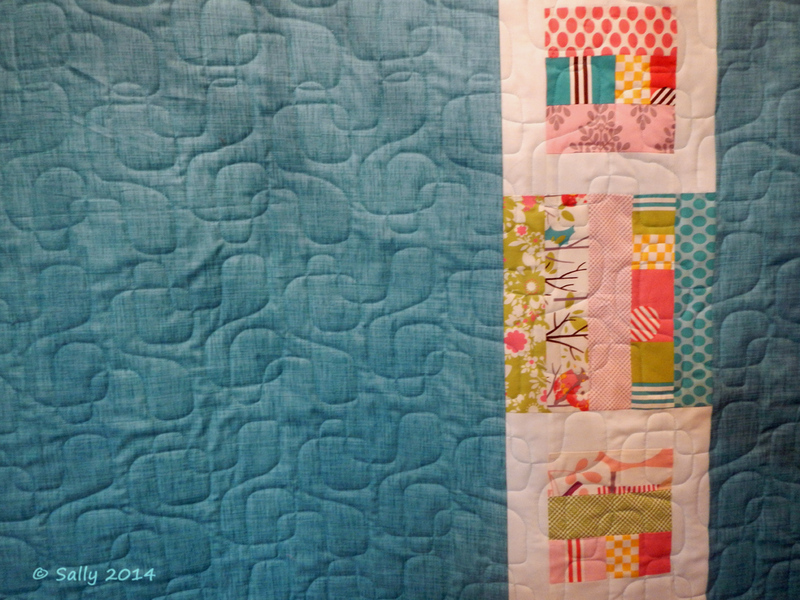 I used a pantograph pattern for the quilting. My mother and I also teamed up to complete a quilt for my sister, Carrie. The pattern is Radio Way by Jaybird Quilts and the printed fabrics were a jelly roll from a designer named MoMo and her "It's a Hoot" line produced by Moda fabrics. I especially love the backing on this quilt. 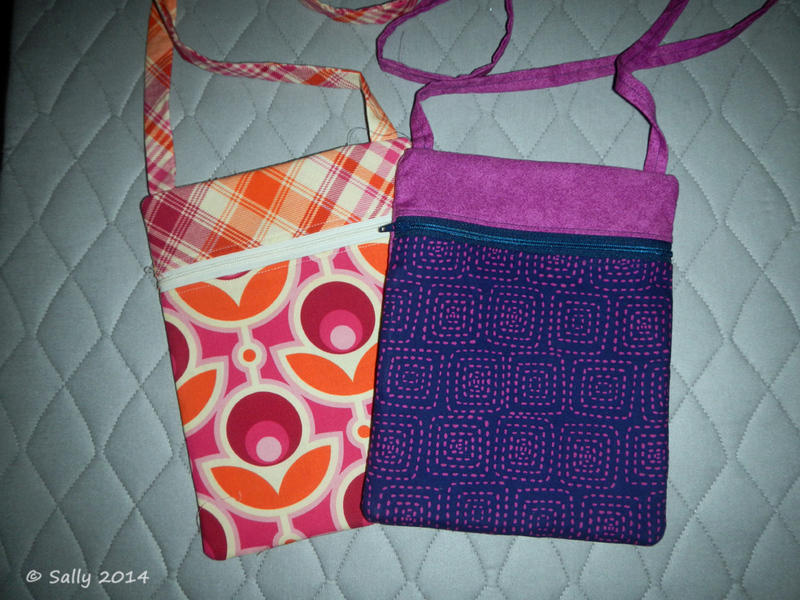 I was inspired by Jan over at Janice Elaine Sews. She always does something special on her quilt backs and I had enough left over strips of fabric to bring a touch of the quilt front to the back. 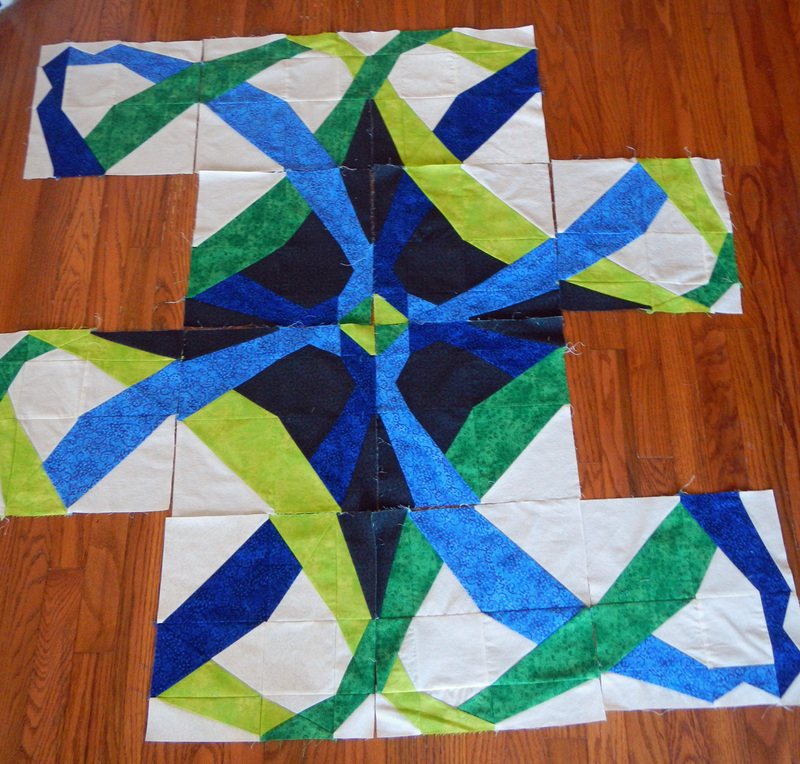 I used a pantograph pattern for the quilt design. 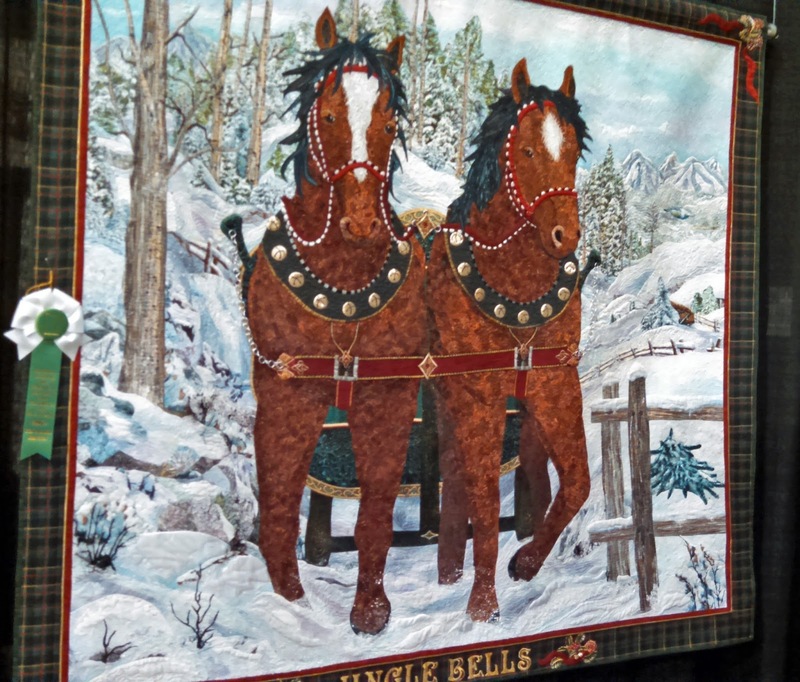 Now that Christmas is over, I can start on Bonnie Hunter's Grand Illusion Mystery Quilt! Now that Christmas is over, I can share several of the projects that were gifts that I worked on. 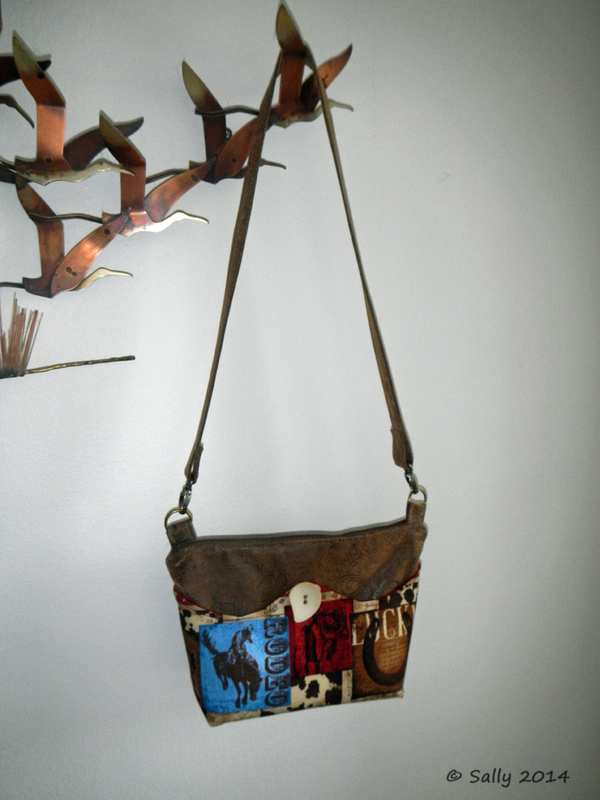 Barbados Bag by Pink Sand Beach Designs. The fabrics in this have gold metallic that don't show up very well in the photos. This was for my sister-in-law. I also made a matching Fiona wallet (pattern by Clobird Designs). 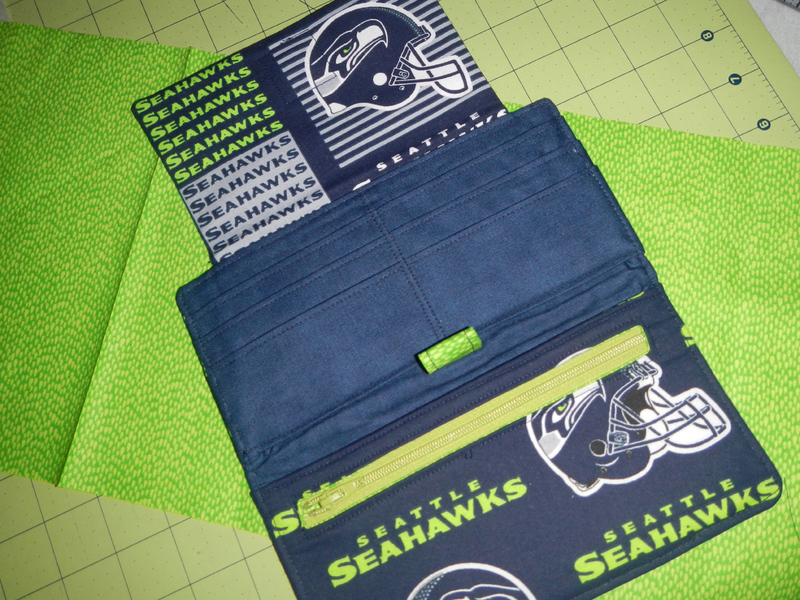 One of these Seahawks wallets (a variation on the Fiona pattern) was a gift to my mom. The other one I will keep since the quality wasn't up to my standards. 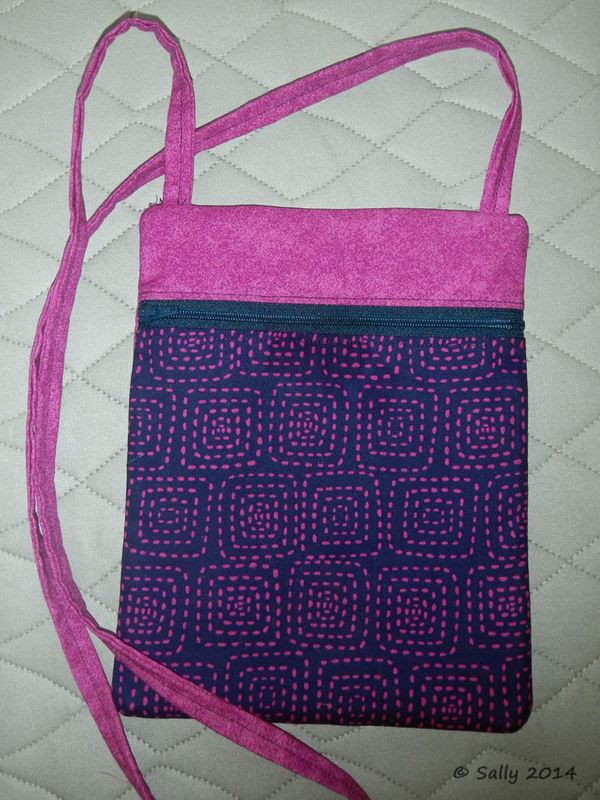 I also made a really nice tote bag from a free online tutorial. It is called the Market Tote from Bijou Lovely (http://www.bijoulovelydesigns.com/2010/05/market-tote-tutorial.html). It is a heavier duty tote than some of them out there. This bag also gifted to a dear friend. I just love the cat fabric! 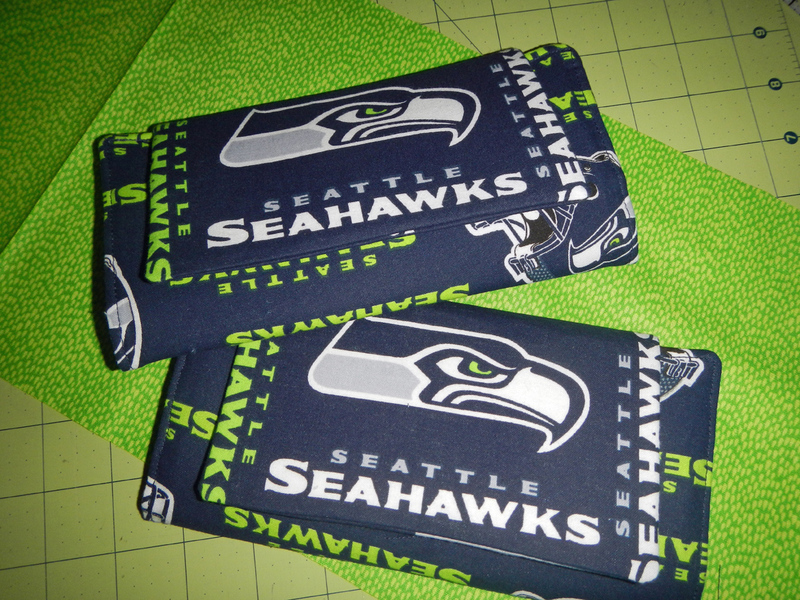 Then I made up a few more runaround bags out of Seahawks fabric, but wouldn't you know, I forgot to take pictures! 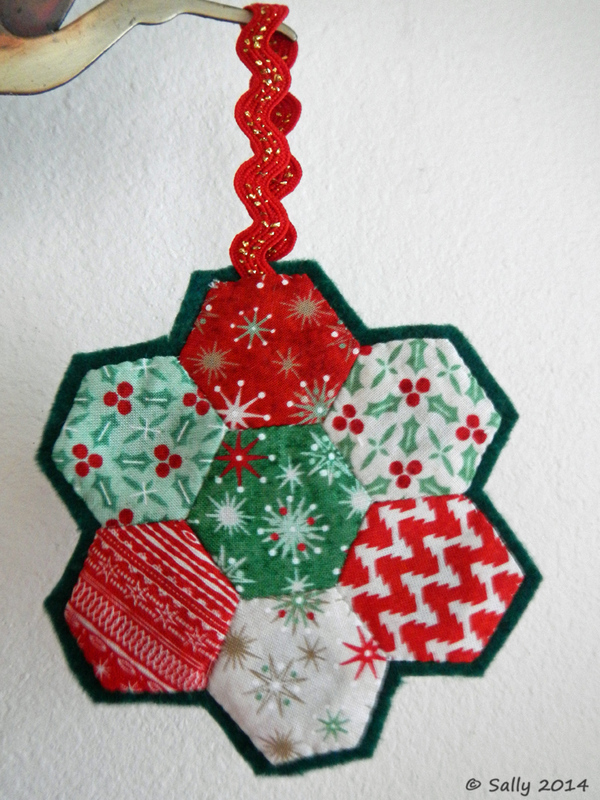 Lastly, although not a bag or tote, I made a hexie Christmas ornament. It is all hand sewn. If you knew me, you would know I do not like hand sewing. However, I learned more about paper piecing while making this. Although the free online tutorial (http://belenpatchwork.blogspot.com.es/2013/03/llavero-de-hexagonos.html) was for a keychain, I opted to go the ornament route. Once again, this was a gift for Susan at our local Post Office. 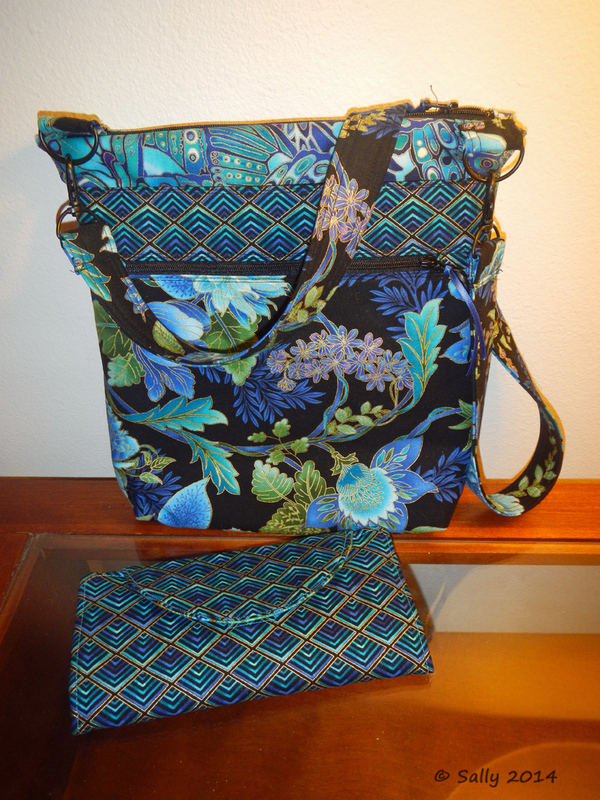 I tried another new pattern this weekend for small crossbody bags called the Runaround Bag by Lazy Girl Designs. I followed the directions as written for my first bag, the navy/purple one. Yeah, I was not impressed with the handle and the fact that you can see the seams inside, even though you zigzag stitch them to clean up the raw edges. I thought the strap was downright ugly as designed. I didn't like the "openness" of the one side of it. 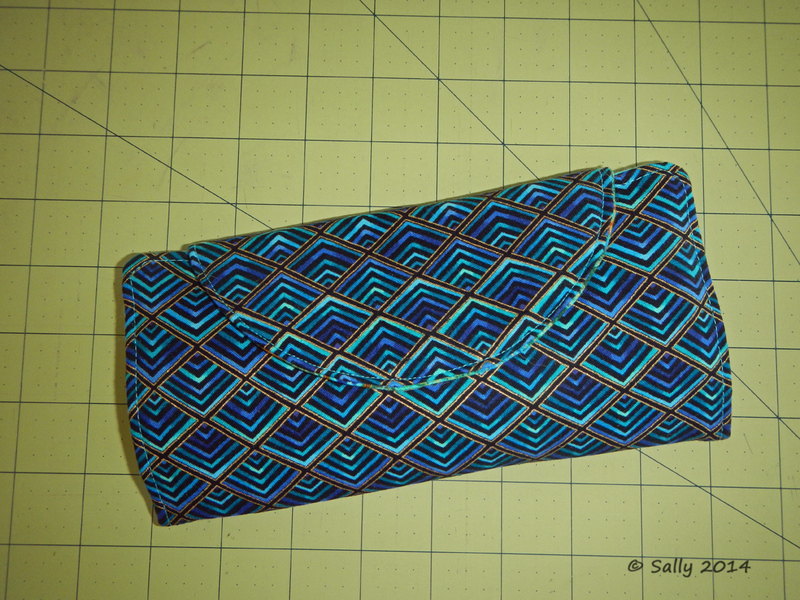 Time for another modification to a pattern which meant I would be making another bag. I used my Dritz Quick Turn tool to do the next strap. It made for a much cleaner and nicer looking strap. 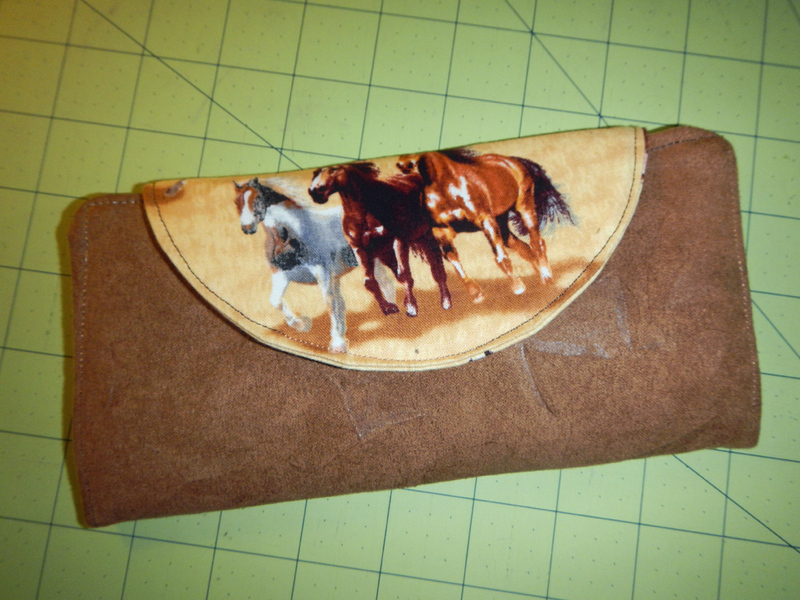 Another thing I did differently from the pattern when I made the strap was to use just one WOF instead of piecing it. Mistake. The strap was too short in my opinion even though the instructions said to make the strap 40-45" long. I also had access to a set of instructions to modify the liner to hide the seams. Incorporated that, too. All in all, it is a nice size bag if you want something small to carry around. Not only does it have a zip pocket to keep items secure, it also has a pocket on the back. A good place to slide your cell phone into. The navy/purple bag is going to be a gift. 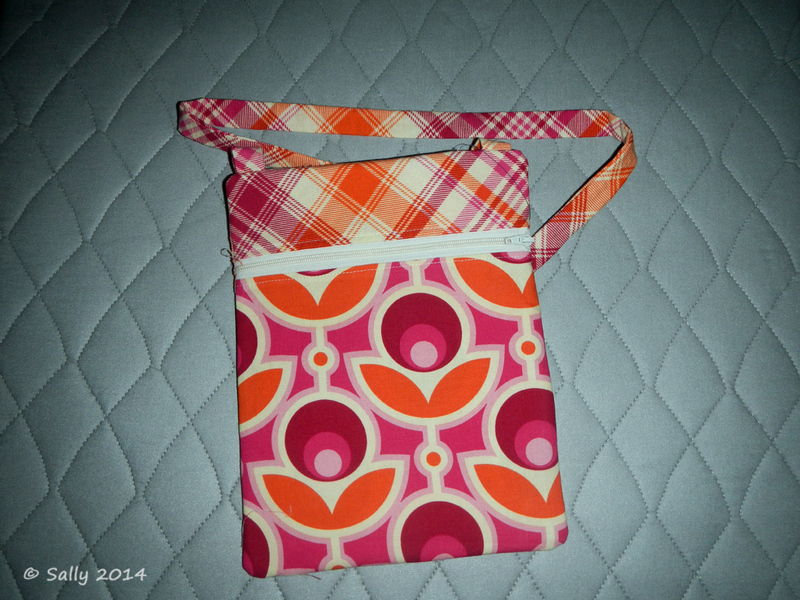 I'll have to figure out what to do with the pink/orange bag since I think the handle is on the short side. My local quilt shop is carrying a pattern called the Versatile Wave by Susan Rooney Patterns. I really like the ability to change the look of the bag by changing the bottom cover. My problem is that I do not like bags with two handles or short ones either. The pattern as is would not work for me. What to do, what to do?? I put on my thinking cap and did some modifications to change it to a one handle bag. And here it is! 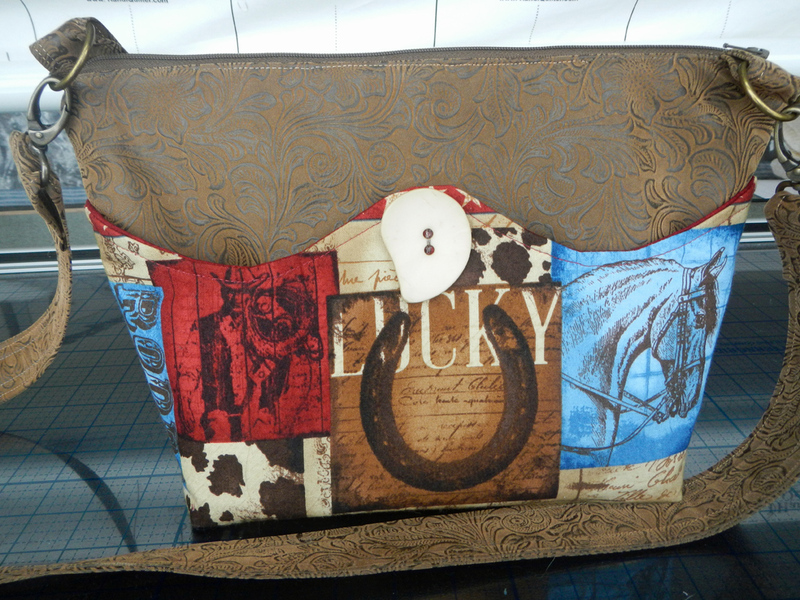 I used a simulated tooled leather fabric for the bag and quilting cottons for the cover. 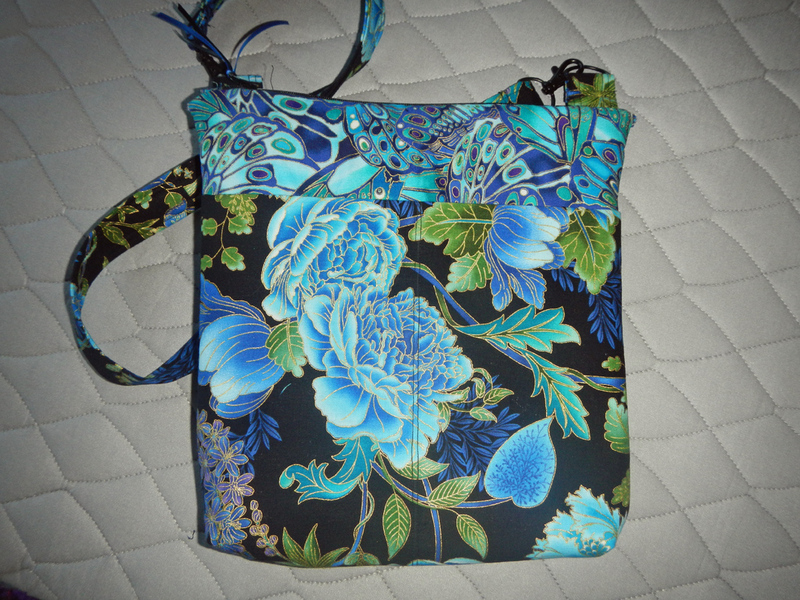 Currently, my cover, although sewn to be reversible, it not removable. My button is too big to fit through the button hole so I need to find smaller buttons. 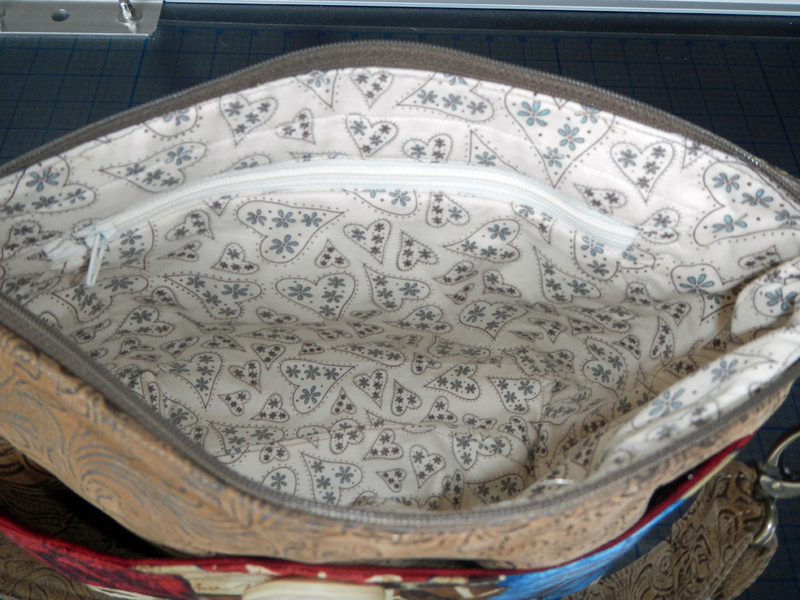 I also want to add a snap to the side seams to help keep the cover attached to the bag itself (since the handles won't do the trick as the pattern intends). 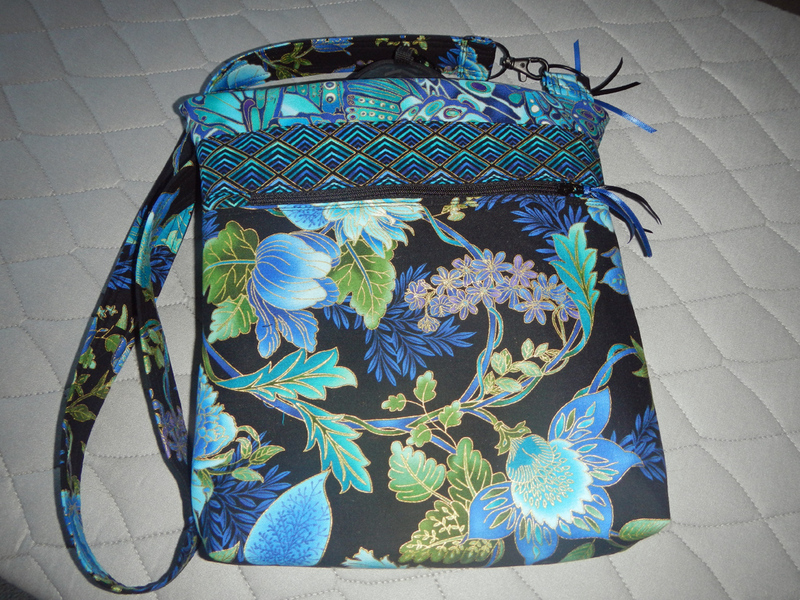 I wish I used the invisible sew-in magnets but didn't think of it until the purse was finished. 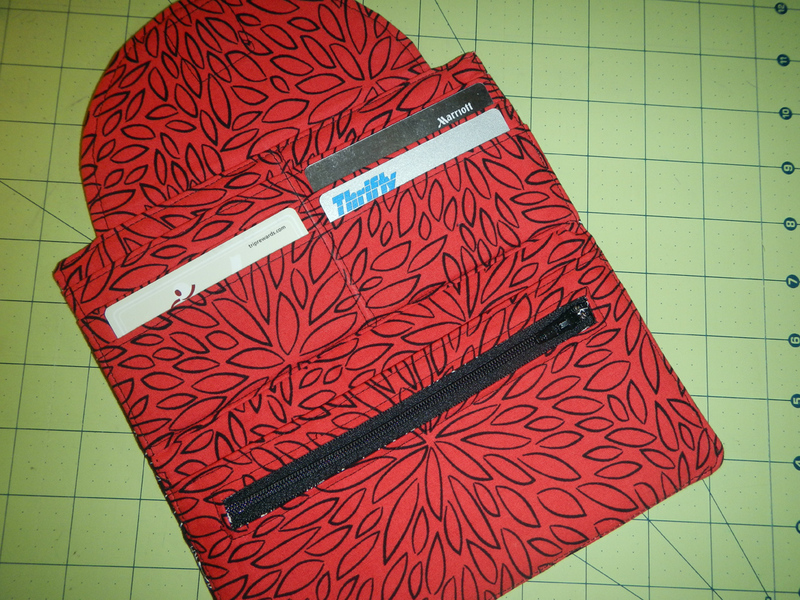 I also modified the interior to add a zippered pocket and I removed the open side pockets. I am not a fan of them. I may make one in black. I haven't decided yet. But still love the concept! 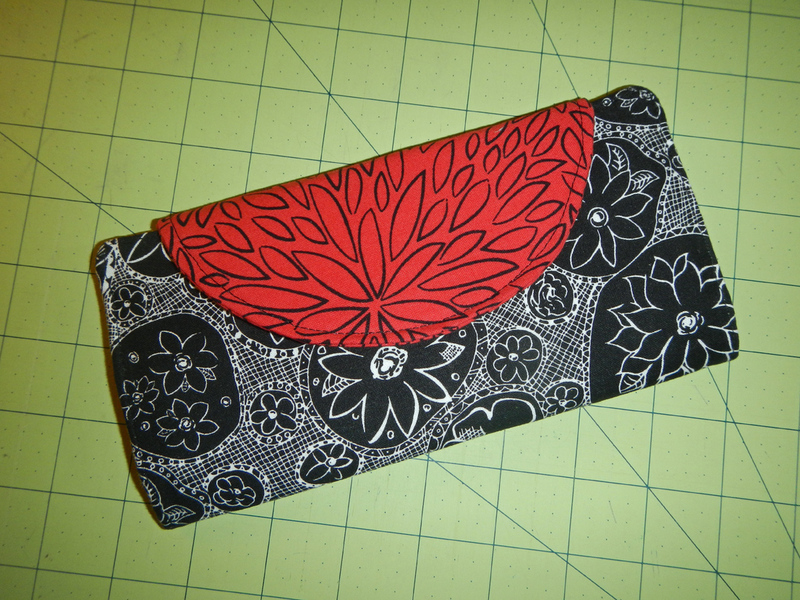 I purchased the neatest little wallet through Craftsy this weekend. It's called "Fiona" by Clobird Designs. 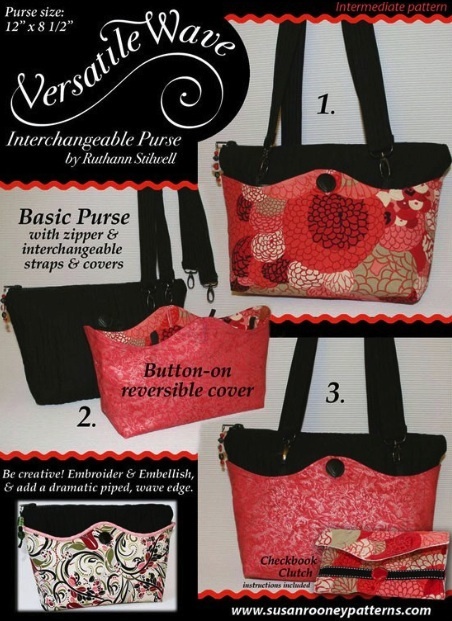 Two fat quarters, a magnetic catch, a zipper and some interfacing and you are ready to sew! I will admit I struggled with my first one, mostly because the written instructions didn't match up to the pictures on the same page. Once I figured that part out, the wallet went together fairly well. 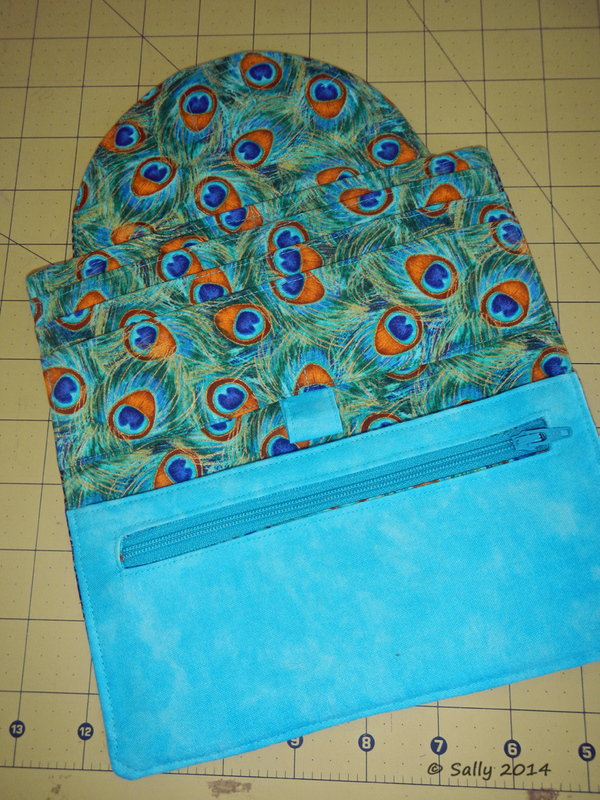 For this one, I used a faux leather material with high quality quilting cotton for the flap and interior fabrics. I also fussy-cut the flap, both inside and out, but didn't do a very good job with interior layout. 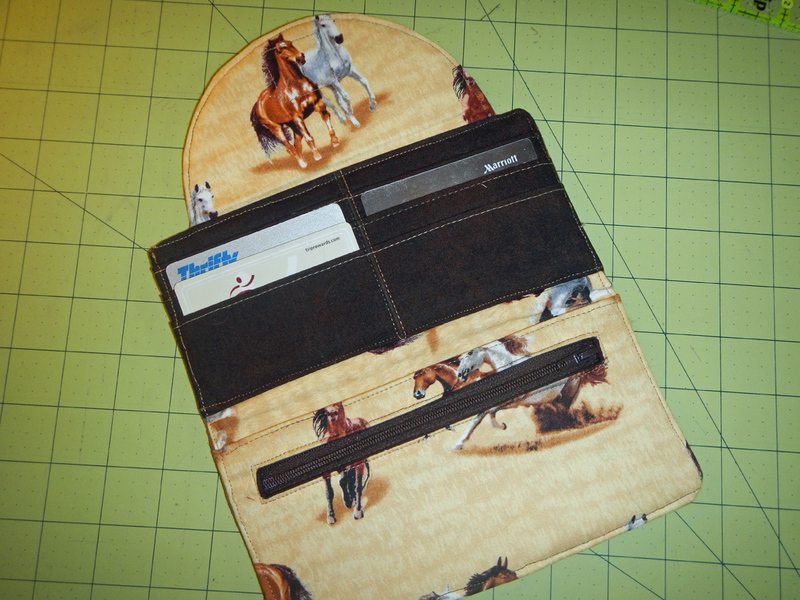 Inside it has six card slots, a zippered pocket for change or whatever, and place to put your checkbook. 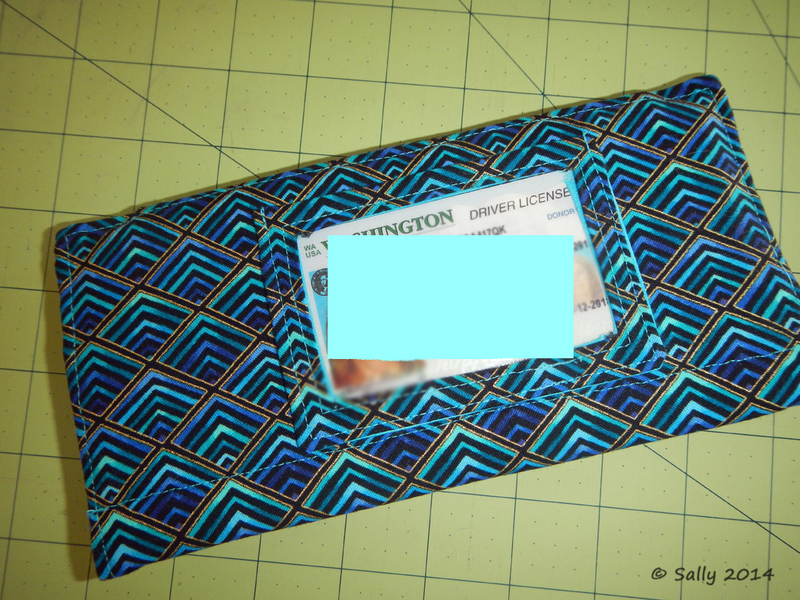 You can also add a pen holder but I never use them in other wallets so I did not include it in this one. I posted this in one of the Facebook groups I am in and made a comment about the layout of the instructions. To make a long story short, the designer of the wallet is in the group and appreciated the feedback. I wasn't the only one who had issues. So Karis is re-working the instructions. I liked this wallet so much I made a second one today. These make great gifts and aren't that expensive either. For around $12 in materials, you can make one, too. I've been busy quilting and sewing but I can't share any of the pictures yet! Gifts, you know. Hopefully after the Christmas holiday I can work on my own stuff. I've been gathering fabrics for projects just itchin' to start stitchin'! My friend, Heather, has talked me into doing Bonnie Hunter's Grand Illusion mystery quilt project. I have never done a mystery quilt before so this is all new to me. 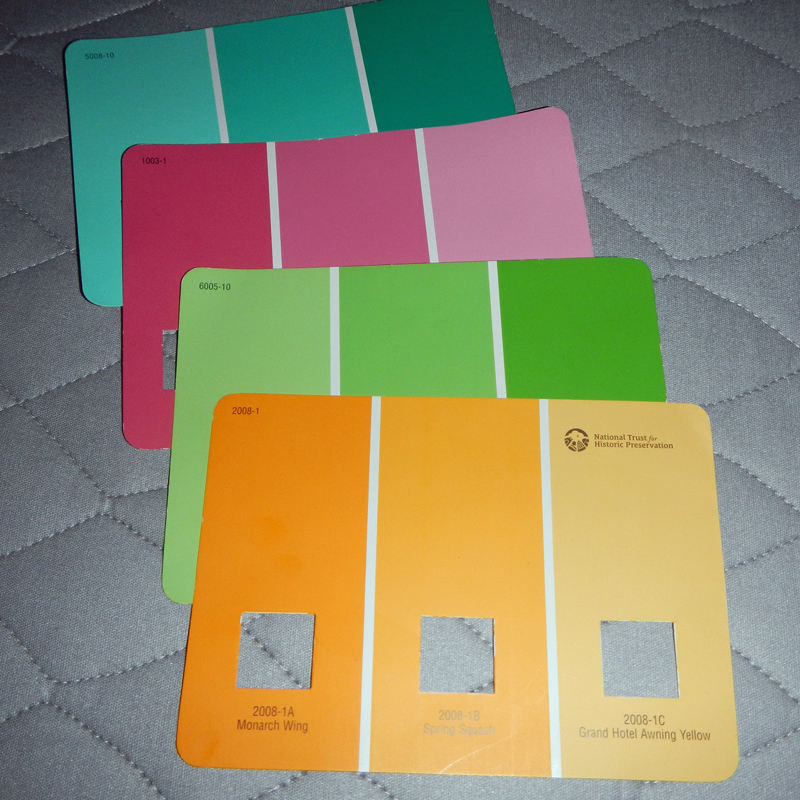 This project starts off with a set of Valspar paint chips from Lowe's that Bonnie has specified along with a list of yardage needed. Then you start gathering your fabrics. You also need a variety of black and neutral fabrics. From what I understand of Bonnie's work (and it is extensive! 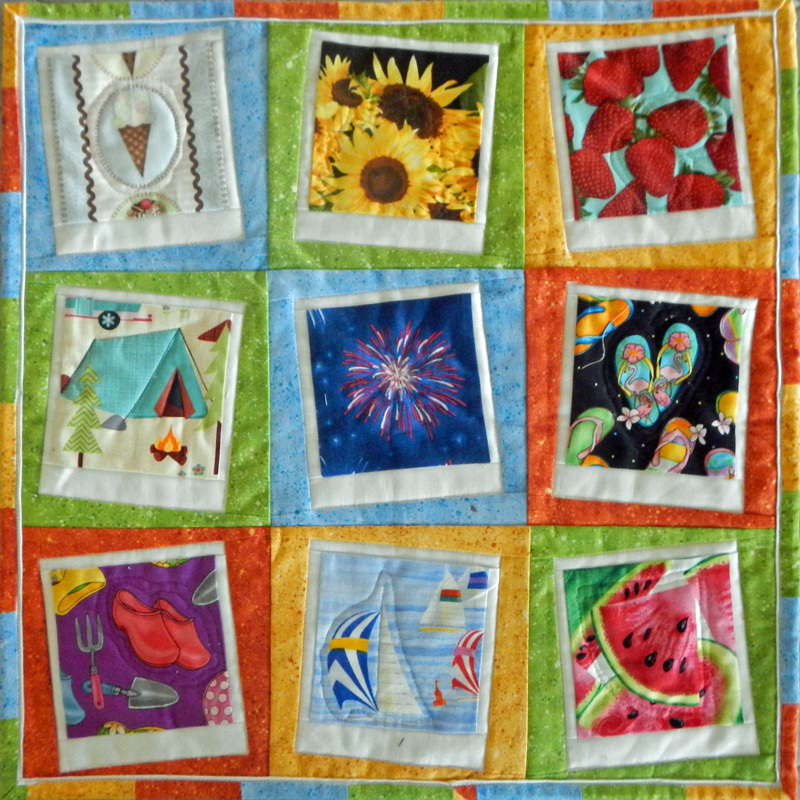 ), she likes scrappy quilts. The Grand Illusion quilt can be done with a single piece of fabric in each color (yellow, pink, green and aqua) or scrappy in those colors. I am going with more of a scrappy style for my mystery quilt. It has been fun going through my stash looking for fabrics. I found a few but my stash is fairly small so I have had to go shopping. Oh, how terrible! Shop for fabrics! The agony. LOL. The yellow is the one constant fabric used through the quilt and I have a fabric selected from my local quilt shop. I will pick it up later this week. I'm fortunate in that my travels for work gives me access to many more shops to look for fabric. Last week, I was able to visit five different stores and I was able to find a few pieces in each one. 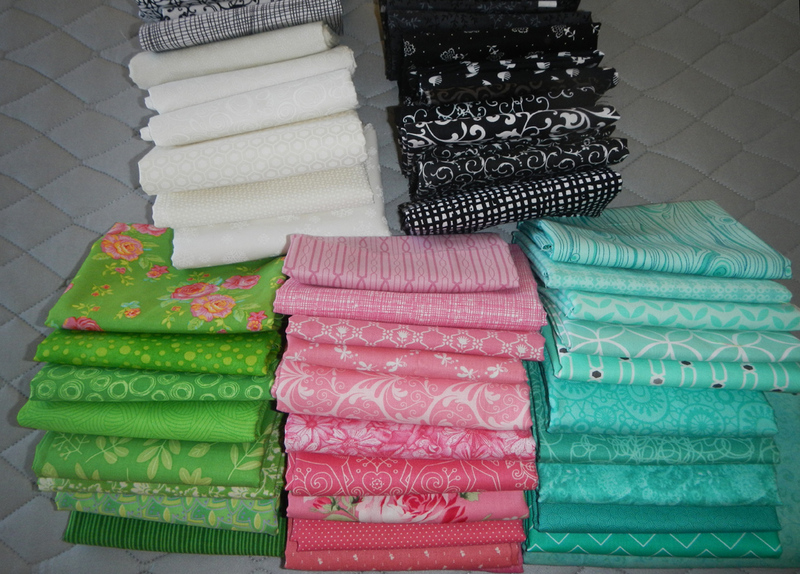 Plus Heather and I went to a quilt show in Spokane last Sunday and I found a few fat quarters there. Heather and I decided we would give each other a piece of fabric that we would share in our quilts. 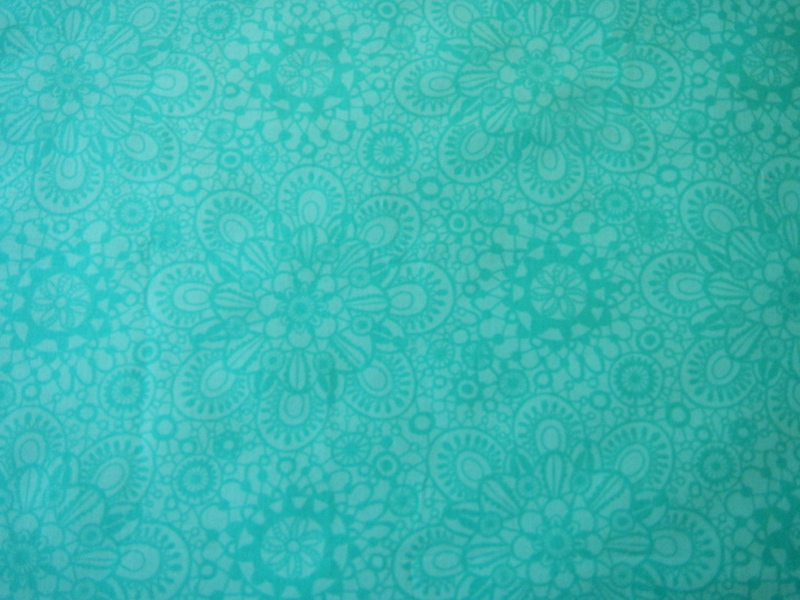 This is the fabric I am sharing with her. The first clue is released on Friday, November 28th. I can't wait to get started! This past summer, my Aunt Sally (who I am named after) contacted my mom and I to see if we would be interested in making a memory bear for a dear friend of hers. The bear was going to be a surprise. Since I didn't know what a memory bear was, I had to do some quick research. To sum it up, it is a bear made from the clothes of a loved one. After talking it over, Mom and I agreed to take this project on. We found a pattern by Simplicity to use and then waited for the shirts to arrive. Our bear was named Harold after the father who had passed away. The shirts that came were favorites of Harold. 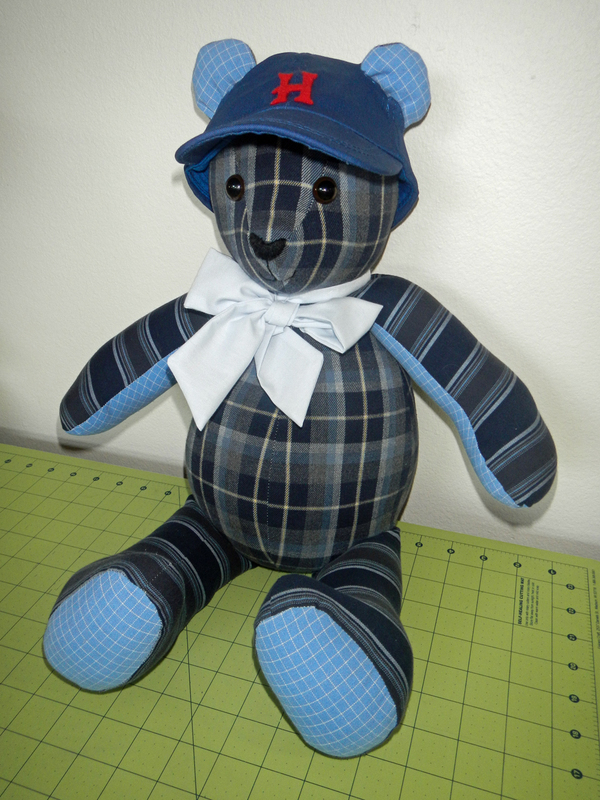 We looked over the patterns and colors and decided the placement of them on Harold Bear. Then it was time to cut and sew. As Harold was coming to "life", Mom decided he needed a ball cap. We found one at Hobby Lobby in Wenatchee and with a few modifications to allow for the ears, a cap was added. It's a little big but still cute. Every now and then you create something knowing that it is going to bring a lot of happiness to someone. You make whatever with love and care. This is certainly the case. We didn't know the real Harold or his daughter that would be receiving the bear unbeknownst to her. Today Kathy, the daughter, received Harold Bear. She recognized her dad's shirts and showed my Aunt Sally a picture of her dad in one of the shirts. Harold Bear is loved very much and it warms my heart to know we have given someone something to remind them of their loved one. In this case, her dad. It doesn't get much better than this. My mom and I decided to do a TQPM Small Kennel Quilt Sew-a-thon a few weekends ago. We churned out twenty-four more for the Carlton Complex fire victims and then dropped them off at the Okanogan County Sheriff's Office for distribution. Such a rewarding feeling knowing you are helping both people and animals. Finished size was about 19" x 19" (I forgot to record the finished dimensions). 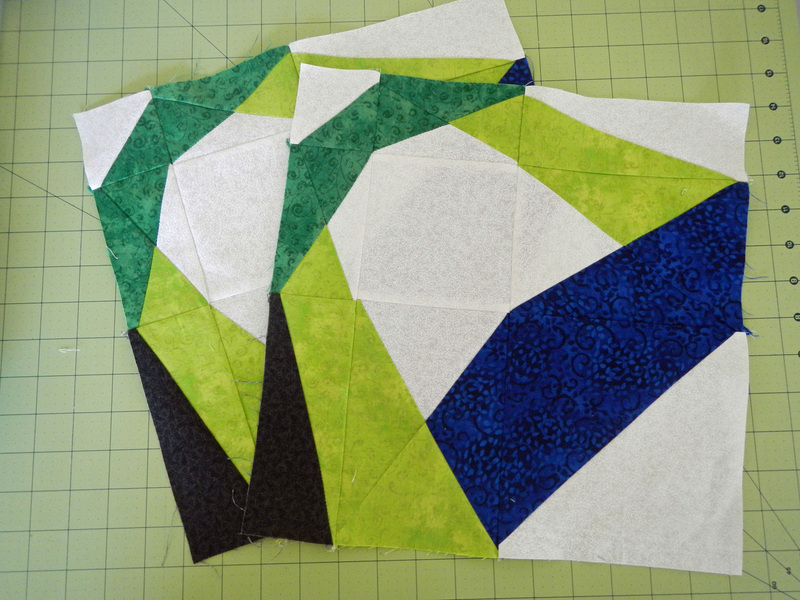 Because my longarm was waiting on a part, I ended up using my domestic sewing machine to quilt it using an echo pattern on elements found in each square. I liked the way it turned it for the most part. 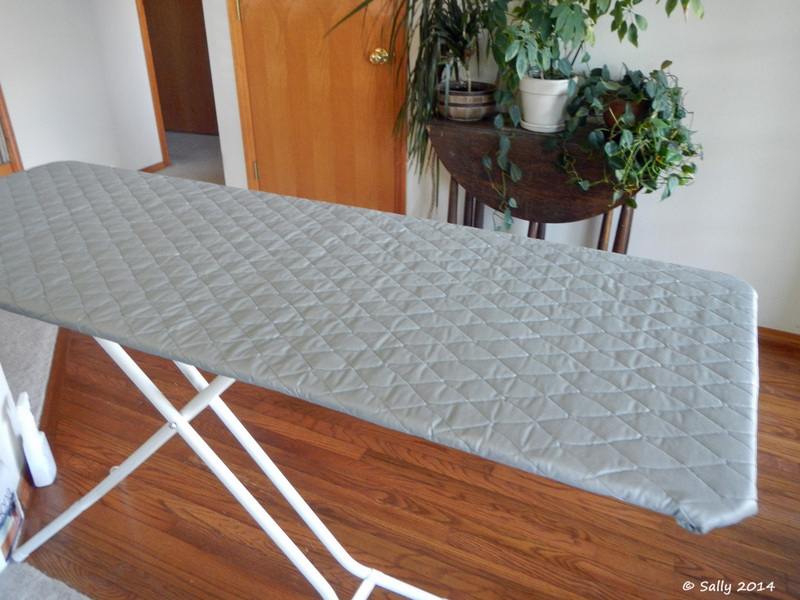 I hated, hated, hated my ironing board. Always felt too small. I had seen those ironing board toppers at a couple of quilt shows, but when your way of getting one home is on an airplane, that isn't going to work. A half sheet (more or less) of plywood, a few wood strips, some screws, staples and ironing board covering fabric were all the materials needed. Using instructions found online here, it didn't take me long to make my very own topper. The finished size of my topper is 22" wide by 60" long. I can iron an entire fat quarter on it not to mention how much easier it is to handle yardage. Now I love, love, love my ironing board. 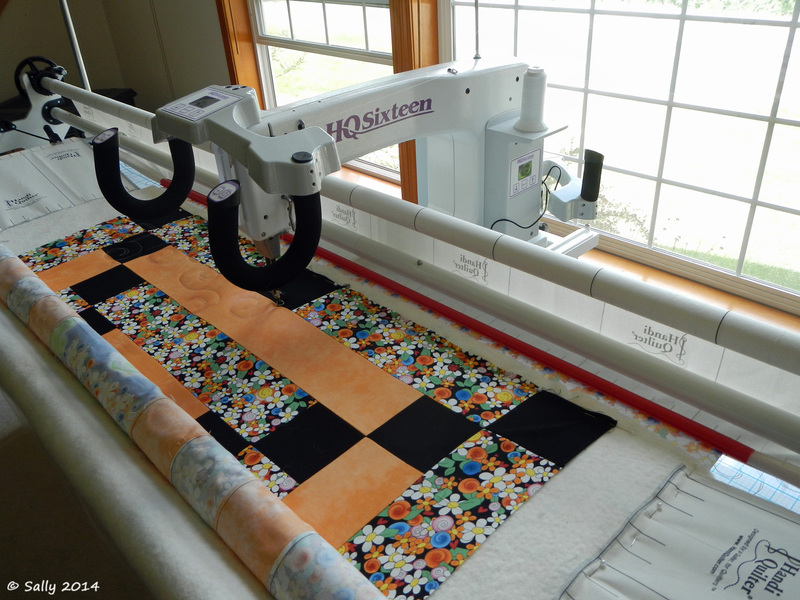 A couple of months ago I purchased a used HandiQuilter HQ16 set up to replace Patience, my Voyager 17 longarm machine. Why the change? I couldn't get my stitch length regulator to work properly and was getting frustrated with my machine. After doing some research, it seemed that this was an issue from the start. I could upgrade my electronics and stitch length regulator but that would cost me several thousand dollars. An investment I wasn't willing to make. On a whim, I started searching on craigslist for a "new" machine. That is when I found Hope. Yep, I named her Hope because I hope to improve my longarm skills on her. I figure the cost of buying this set up less what I will sell my Voyager for is about the same as what the upgraded electronics would have cost. I was able to transfer over my Red Snapper system, light bar and batting cradle that I made. I float my batting and like to keep pet hair off of it. The clear vinyl cradle does the trick for me. That is what you see wrapped around the front poles. The system I bought had the upgrade rails & poles along with the base cabinet system. While it is a bit taller overall that I am used to, I am liking seeing the stitching without bending over as much. I know, an adjustable studio table would have solved this but the storage underneath is just awesome! I did end up replacing the front handles so I could have the tilt screen on it. The original set had a screen but it faced up and I couldn't see it without getting a stool to stand on. I also upgraded the carriage tracks and wheels. It had the original plastic tracks with a few wear spots on them. Changing the plastic out to a metal track just made sense, especially since the table rails were already done. I am enjoying this new system. So far, so good. I think I'll be sticking with this set up for a long time to come. Plus, the folks at HandiQuilter have been terrific to deal with - from the sales to the support people. 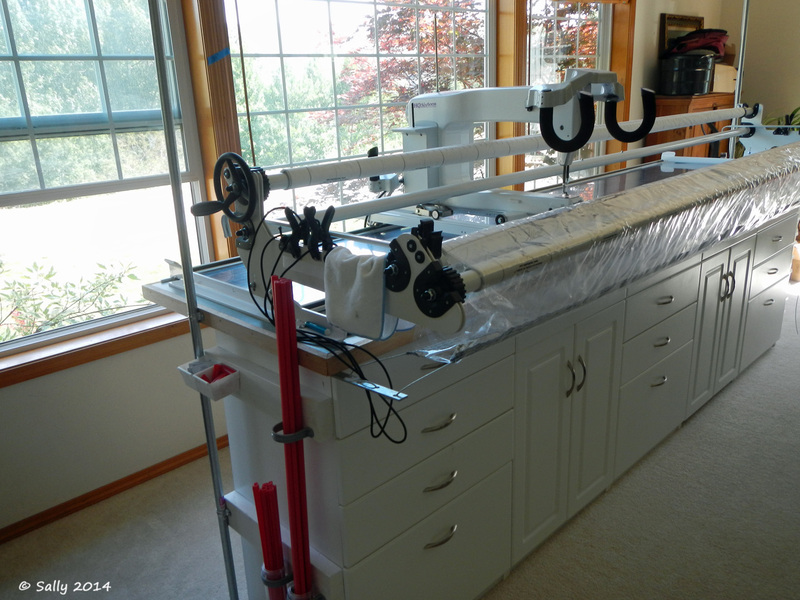 I am super pleased with my dealings and would recommend them to anyone looking to buy a HandiQuilter machine. Earlier this year, I joined an AnglePlay® group on facebook. 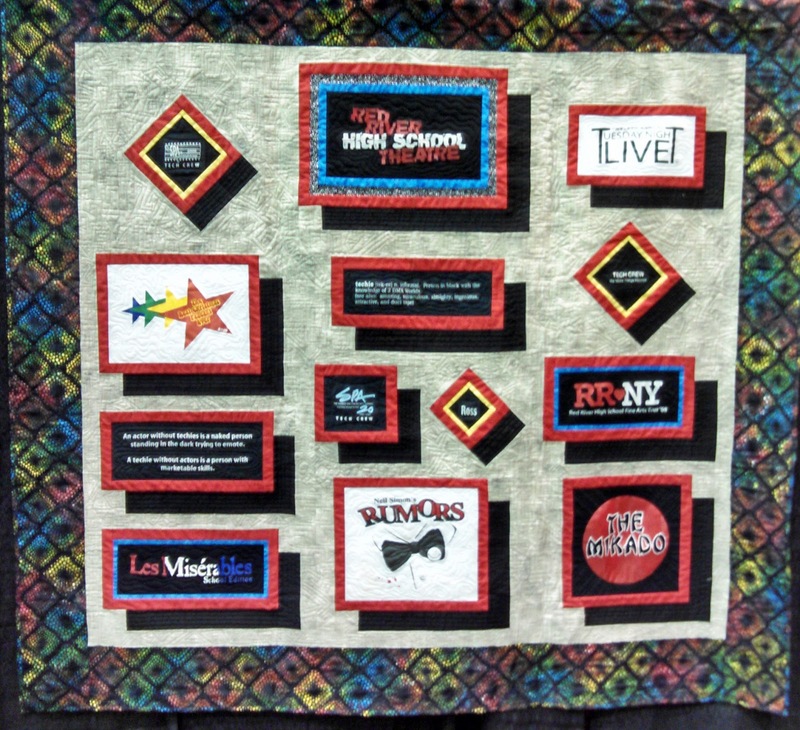 "This is a community of beginning through advanced quilters who love to "reach for the unexpected" using Margaret Miller's AnglePlay® templates." I haven't done much with templates and was looking to branch out and add to my quilting skills. I joined the group, bought the templates and started in with the Block of the Month, "Ribbon Rhythms", for 2014. Oh my! It was quite the challenge for me at first, but the online videos were very helpful. I just completed Block 6 out of 8 and am getting the hang of this now. We make two of each block every month. I can't wait to start quilting this project when we finish in the next couple of months. 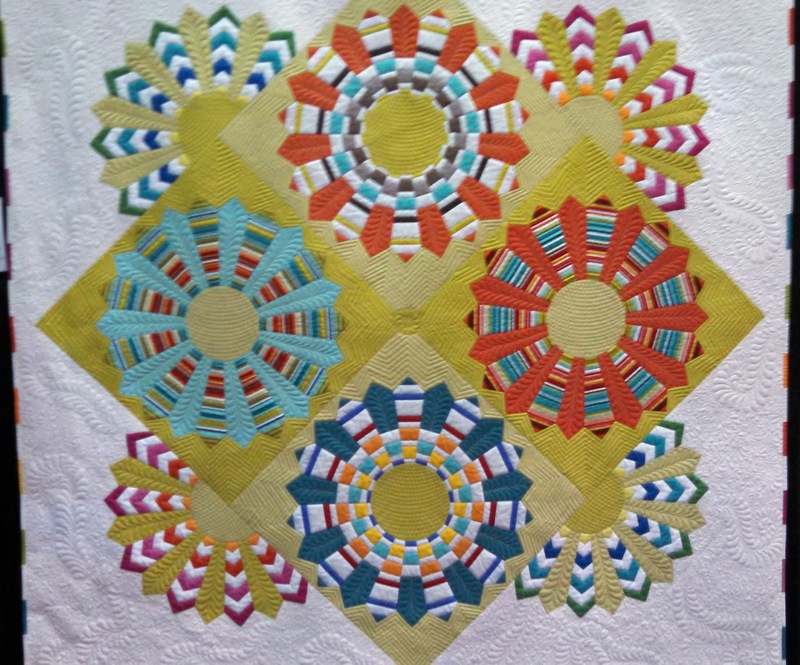 For more information on AnglePlay, visit the facebook group (linked above) or go to http://www.millerquilts.com/. My mom got me started on a new charity sewing project. No, I'm not abandoning Quilts Beyond Borders - far from it! 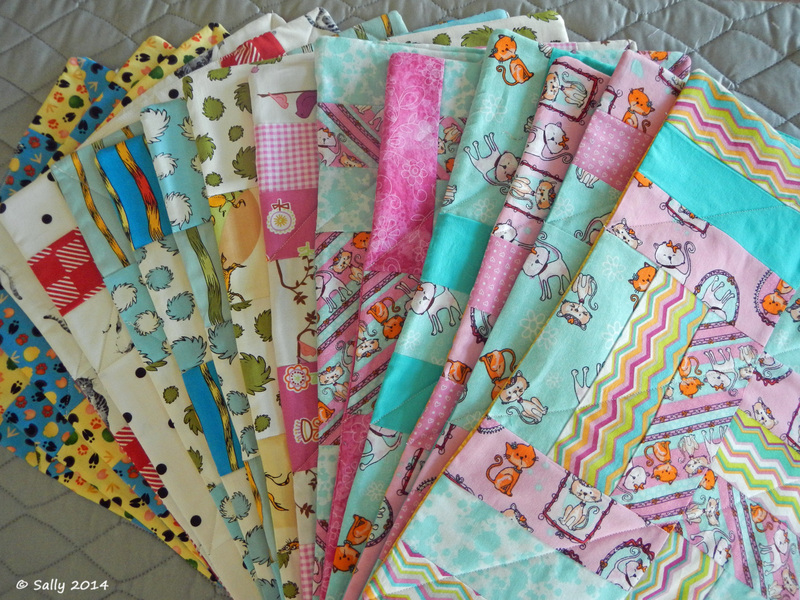 I am adding in a new one - TQPM Small Kennel Quilts. 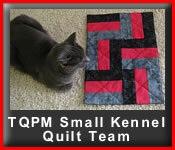 The TQPM Small Kennel Quilt Team is a volunteer organization that is available when disasters strike. It is a way to join a larger effort to help our animal friends in times of need by doing what we love. They supply kennel quilts to shelters in times of need. With the recent Carlton Complex fires here in the Methow Valley in Washington State, over 300 homes were lost in the firestorm. Families, pets and livestock were displaced. My community has been severely impacted and was the impetus for me to give back to those in need. These are small little quilts that don't take much material or time to make. 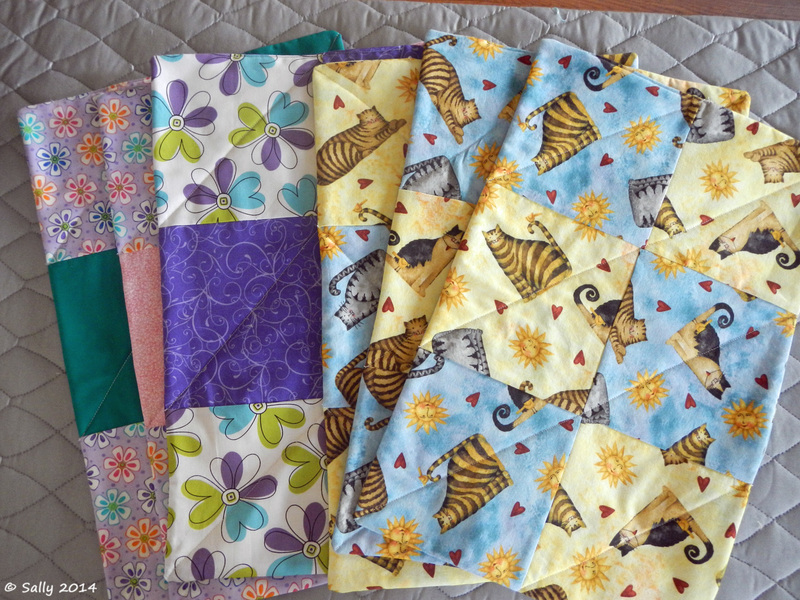 I have been able to use scraps from my QBB quilts and one I made for my son. Our local quilt shop is getting in on the action, too. At our Open Sew this coming Tuesday, we are going to crank out some more. These are the first six kennel quilts I have completed. They have already been delivered to the shelter in Okanogan. I recently signed up for a facebook group to exchange doll size quilts. I enjoy participating in swaps including one I already do to exchange 1 yard of fabric each month with a new swap partner. 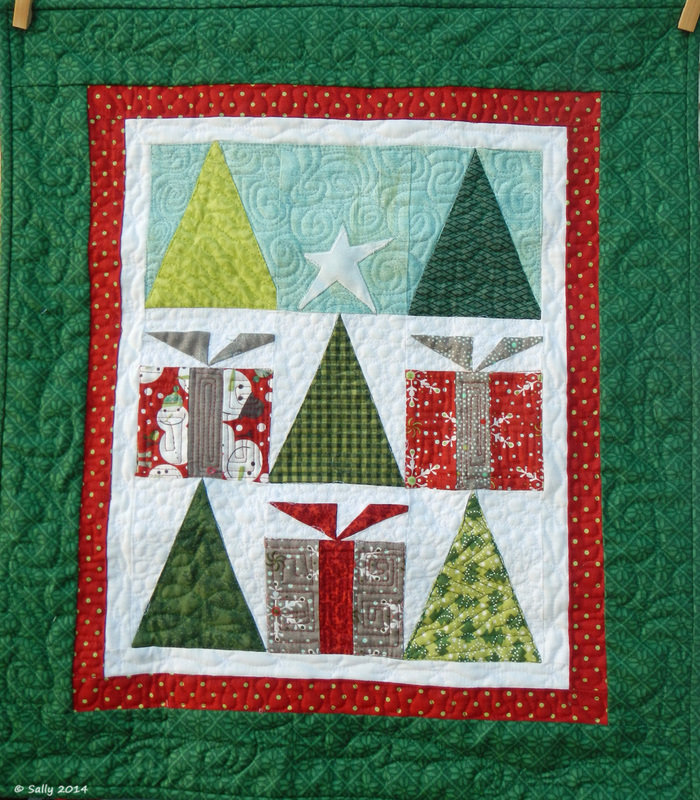 July's theme for the doll quilt swap is Christmas in July. I had fun planning my quilt layout and then making and quilting it. 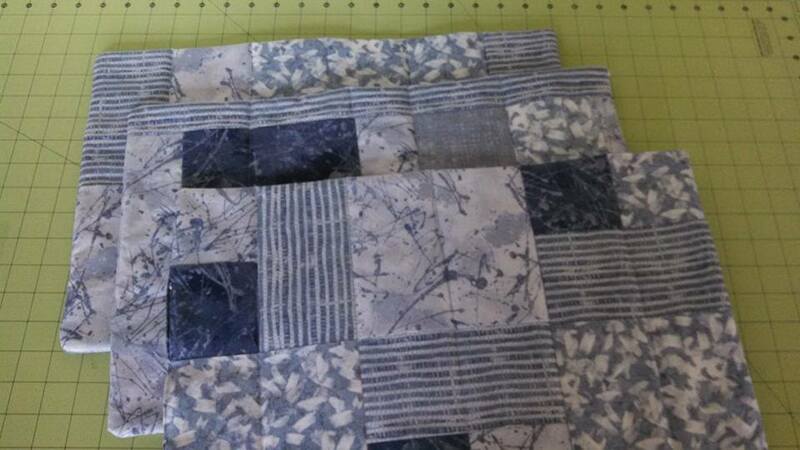 I especially enjoyed the quilting part since I did it all freehand and used it as a learning experience for doing filler patterns. I am pleased with how it turned out and I think my swap partner, Sandy, will like it, too. 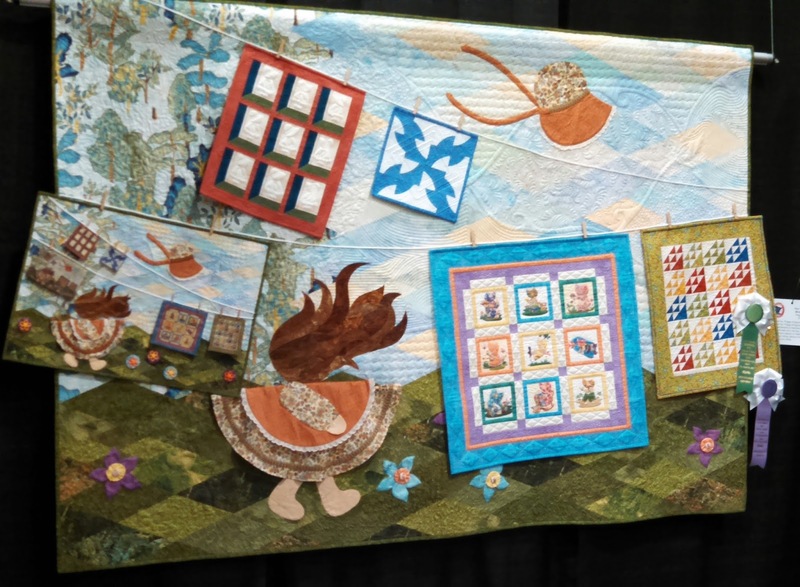 About a month ago, I had the pleasure of traveling two hours each way to attend the Minnesota Quilters' Show and Conference in St. Cloud. Two hours? Each way? Are you nuts, Sally? Uh, yep. But if you were able to see those gorgeous quilts, you would do it, too. The show had a juried section, a non-juried section and another section with various groupings. Plus they had rows and rows of vendors selling fabrics, quilting supplies, and machines. I only had my cell phone with me so many of the photos I took didn't turn out. I will share some of the ones that did. Under each photo, I will share what was written on the information card for the quilt. This was one of my favorites. The details were simply amazing! Look closely. Pieced by Peggy Kragnes, Quilted by Peggy Kragnes. 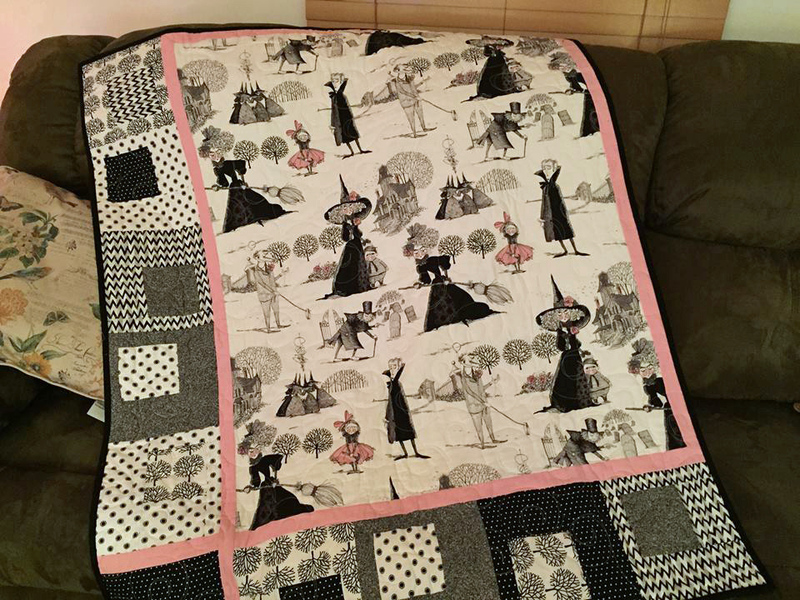 Not necessarily a Sunbonnet Sue fan, the idea for this quilt was born during a sleepless night. I enjoyed every aspect of making this quilt (these quilts!) including hiding various things in the quilting. I hope it makes you smile. This was a beautiful quilt with embellishments on it. The photo doesn't do it justice at all. I was surprised to see that it was made by a lady from Washington state. Since this was one of the first quilts I looked at, I expected the show to be only Minnesota quilters. Pieced by Kathy McNeil, Quilted by Kathy McNeil. Memories of a family Christmas sleigh ride. I really wanted to make the snow look like a watercolor painting done with fabric. Techniques include hand applique, beading, over dying with fabric paint crayons, machine and hand embroidery, embellishments of year, chain link, hot fix crystals and sequins. As soon as I saw this quilt, I was immediately reminded of home. 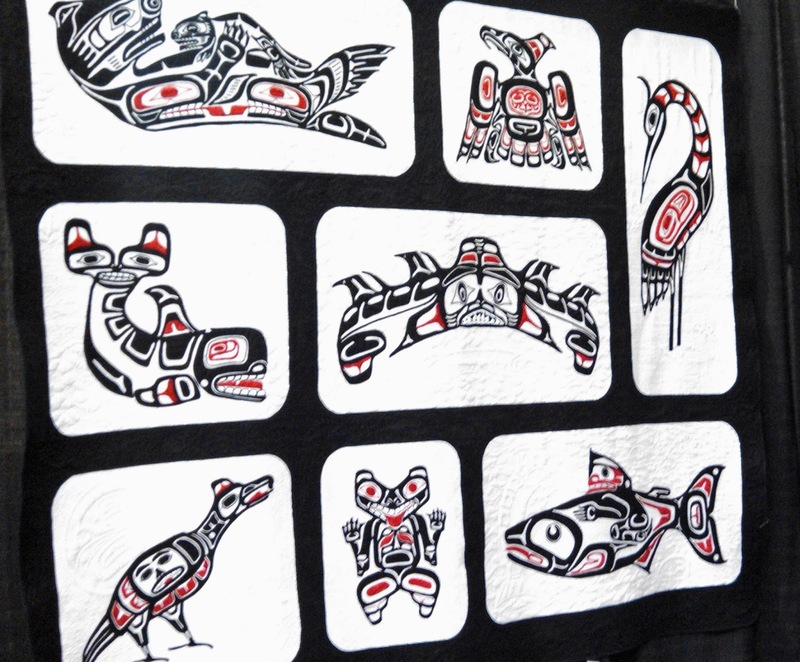 This type of art is done by the many Native American peoples that live around Puget Sound. I was not surprised to see the quilt was made by a woman from Seattle. Pieced by Georgia Pierce, Quilted by Georgia Pierce. Interpretation of images from Kevin Clark and Jim Gilbert's book, "Learning by Design: Pacific Northwest Coast Indian Art". Done by needle turned applique and free motion quilting. 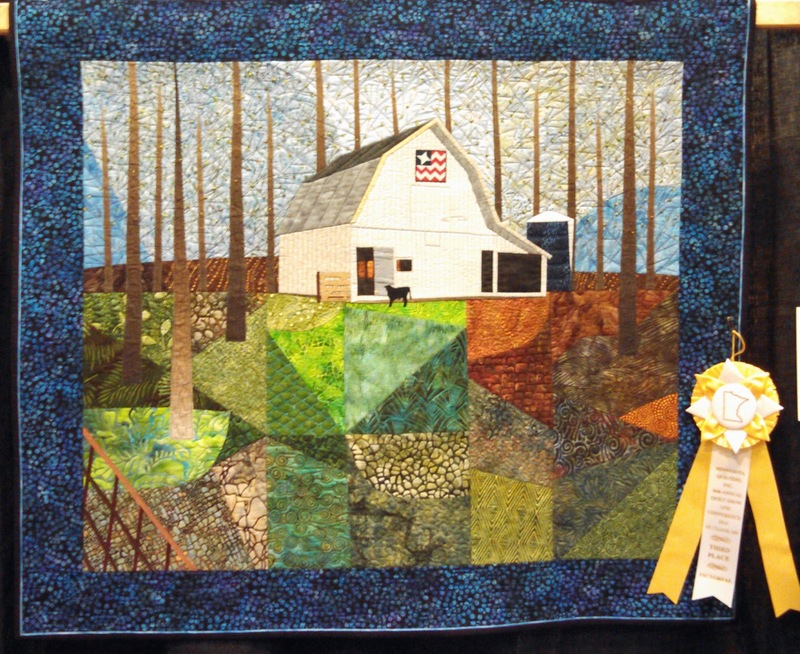 I liked this quilt because it has a barn with a quilt block on it! Pieced by Terri Krysan, Quilted by Page Johnson. This quilt honors all of the pieces that come together to describe a farmer: the tenderness to deliver a calf, the commitment to tend the land, love of family and respect for those that came before, an unwavering patriot, and the optimism that always expects a bumper crop every fall! I was drawn to this quilt because of the colors and simplicity of design. Pieced by Diana R. Wilson, Quilted by Diana R. Wilson. This was made for my son who is a carpenter. It won a blue ribbon at the 2013 MN State Fair. It took 6 months to hand quilt working fairly steady. This was an immediate "Wow" burst of color. After reading the card, I realized I had been to the quilt store mention and yes, the wall of batiks is impressive. Pieced by Michael Johnson, Quilted by Michael Johnson. Using the Athena's Puzzle Pattern. 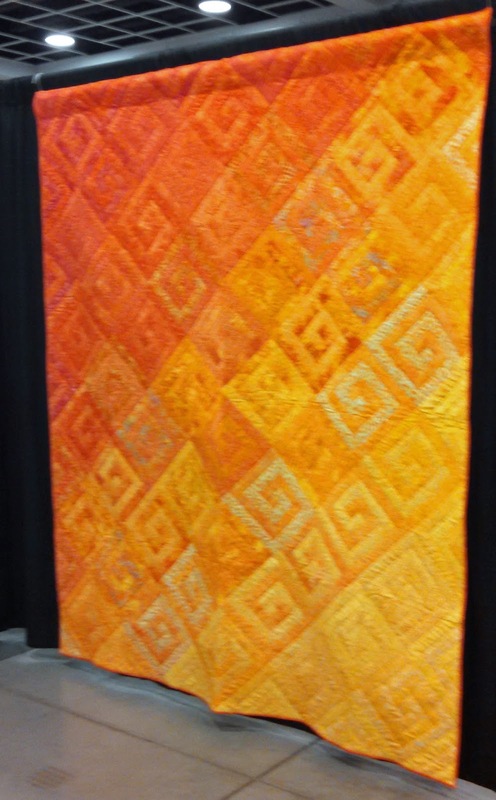 I was inspired by the big wall of orange and yellow batiks at Blue Bamboo Quilt Store. I liked how the quilter did this t-shirt quilt. 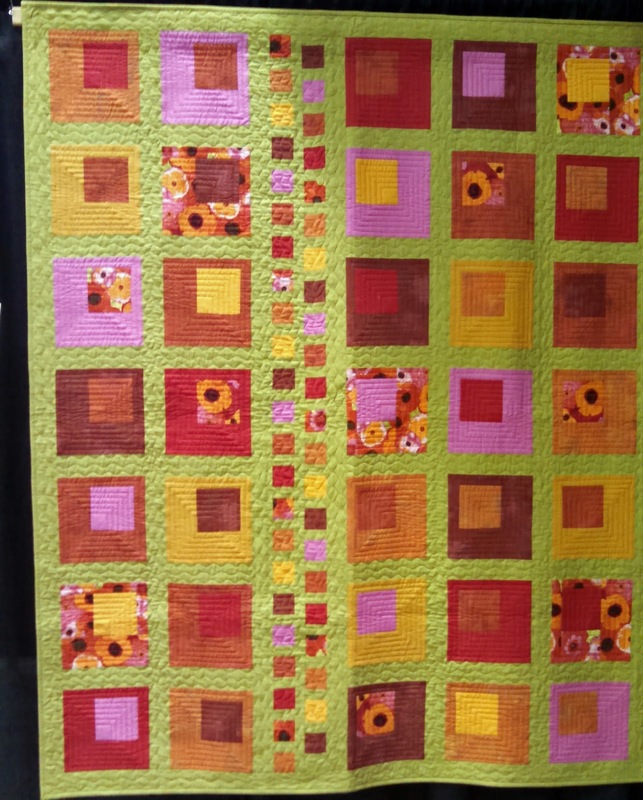 Quilted by Kathy Fellbaum. How can ten tees become a tribute to high school theater productions? First it was the colors that got my attention, then it was the detailed quilting. This quilt should have been in the judged division. I loved it! 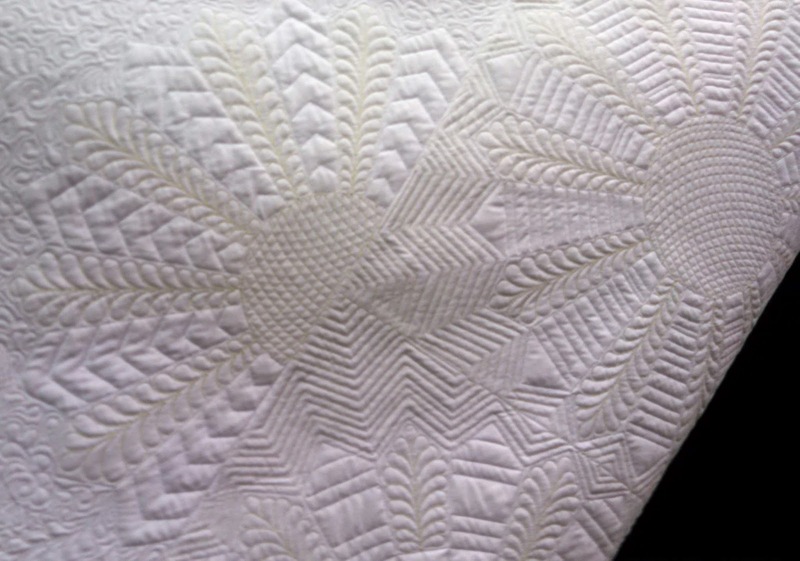 Quilted by Richard Larson, Pattern by Victoria Findlay published in American Patchwork and Quilting magazine. Dresden plate blocks, set on point, side by side to create a diamond shape with an appliqued circle at center of block intersects. Use of stripes in alternating petals creates movement and illusion of more piecing. Close up shot of the quilting details on the back of the quilt. I must be on a green kick or something because this beauty also caught my attention. 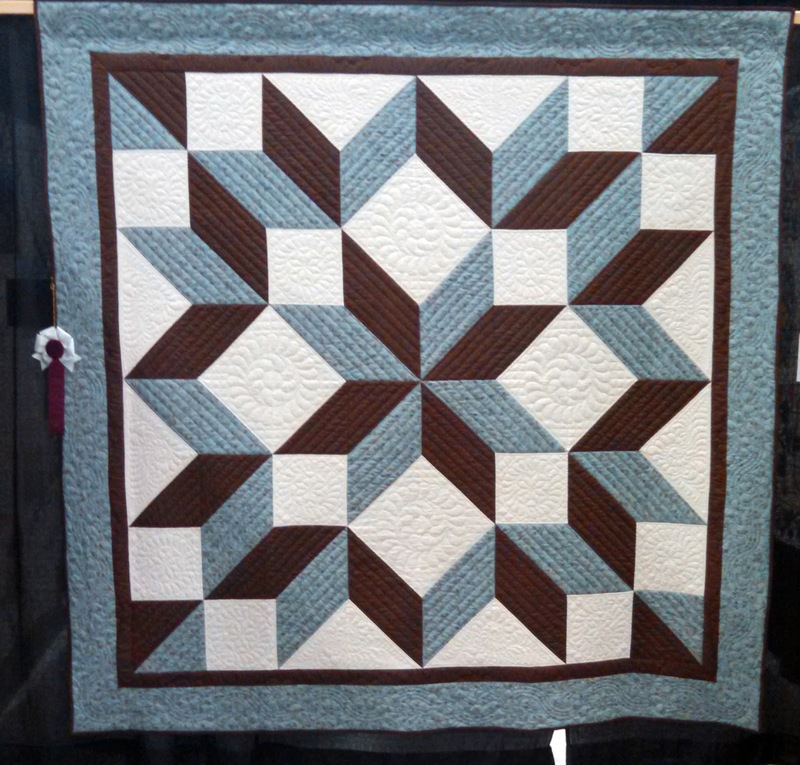 Twin Cities Quilting Solid Challenge. 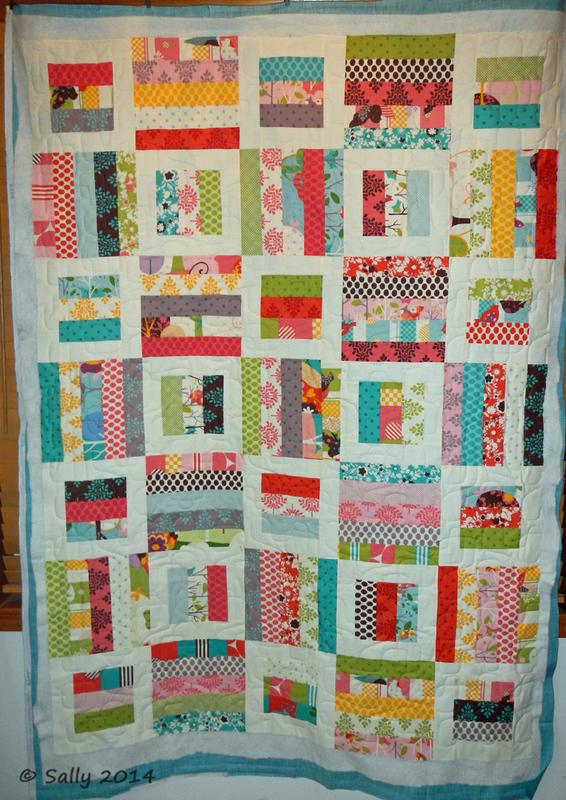 Quilted by Liz Hickerson. 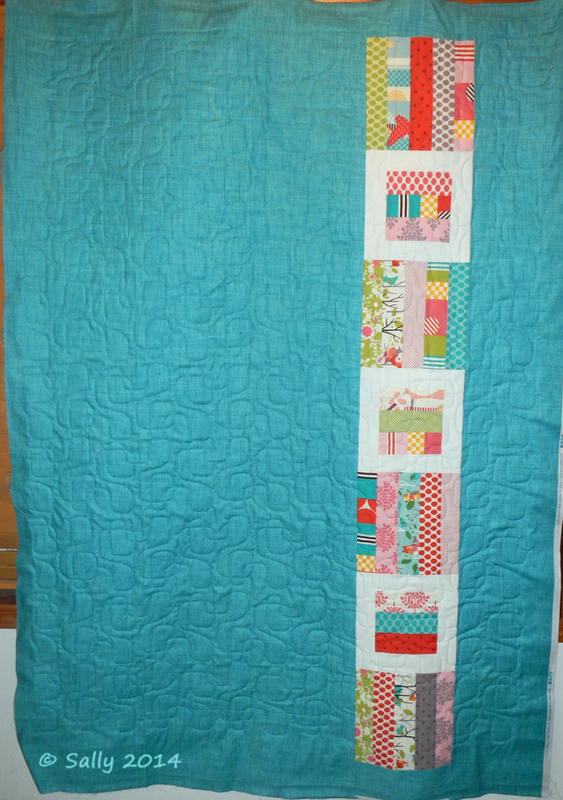 Adapted from the Twin Cities Quilting Lexington Square pattern. I had so much fun at this show. I spent about six hours there admiring the talents of many quilters and then melting my credit card in the various vendor booths. It was worth the drive and I look forward to going to my next show.